will be far larger in the Magnetic Circuits core in Fig. 2.1 than in the air paths. Hence, it is safe to assume that the magnetic flux set up by mmf Ni is mainly confined to the ferromagnetic core and the flux set up in air paths is of negligible value. The flux set up in air paths is known as the leakage flux as if it leaks through the core; some of the leakage flux paths are shown chain-dotted in Fig. 2.1. There is no way to avoid magnetic leakage as there are no magnetic insulators in contrast to electric insulators which confine the electric current to the conductor for all practical purposes. The effect of the leakage flux is incorporated in machine models through the concept of the leakage inductance. Imagine that you are holding a current carrying conductor in your right hand with the thumb pointing in the direction of current. Then the direction in which the fingers curl gives the direction of flux. In case of a coil you imagine that you are grasping the coil in right hand with the thumb in the direction of current; then the fingers curl in the direction of flux. The reader may apply RHR to the exciting coil in Fig. 2.1 to verify the direction of flux as shown in the figure. The magnetic field intensity H is tangential to a flux line all along its path, so that the closed vector integration in Eq. (2.2) along a flux-line reduces to closed scalar integration, i.e. With the assumption of negligible leakage flux, the flux piercing the core cross-section at any point remains constant. Further, from the consideration of symmetry it immediately follows that the flux density over straight parts of the core is uniform at each cross-section and remains constant along the length; such that H is constant along the straight parts of the core. Around the corners, flux lines have different path lengths between magnetic equipotential planes (typical ones being ab and cd shown in Fig. 2.1) so that H varies from a high value along inner paths to a low value along outer paths. It is reasonable to assume that H shown dotted along the mean path will have the same value as in straight parts of the core (this mean path technique renders simple the analysis of Magnetic Circuits of machines and transformers). It has been seen previously that the magnetic field intensity along the mean flux path in the core can be regarded constant at Hc. It then follows from Eq. (2.4) that If one now imagines that the exciting current i varies with time, Eq. (2.6) would indicate that Hc will vary in unison with it. Such fields are known as quasi-static fields in which the field pattern in space is fixed but the field intensity at every point varies as a replica of the time variation of current. This simplified field picture is a consequence of negligible displacement current in slowly-varying fields as mentioned earlier. In a quasi-static field, the field pattern and field strength at a particular value of time-varying exciting current will be the same as with a direct current of that value. In other words, a field problem can be solved with dc excitation and then any time variation can be imparted to it. and P = 1/R = permeance of the Magnetic Circuits. It is, therefore, seen that by certain simplifying assumptions and field symmetries, it has been possible to lump the distributed magnetic system into a lumped magnetic circuit described by Eq. (2.7) which is analogous to Ohm’s law in dc circuits. 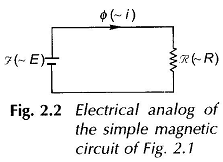 The electrical circuit analog of the magnetic system (now reduced to a magnetic circuit) is shown in Fig. 2.2 Fig. 2 2 wherein (mmf) is analogous to E (emf), R (reluctance) is analogous to R (resistance) and Φ (flux) is analogous to i (current). (ii) when time-varying, the magnetic circuit still remains resistive as in Fig. 2.2, while inductive effects are bound to appear in an electric circuit. This is because there is no time-lag between the exciting current and the establishment of magnetic flux (quasi-static field). 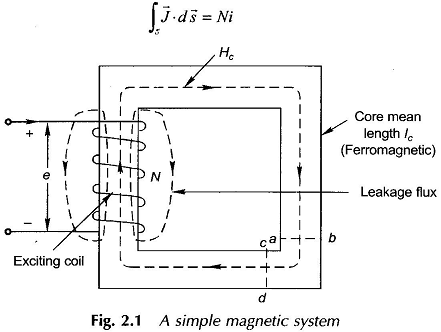 The lumped magnetic circuit and its electrical analog are useful concepts provided the permeability (μ) of the core material and, therefore, the core reluctance is constant as is tacitly assumed above. This, however, is not the case with ferromagnetic materials, but when air-gaps are involved, the assumption of constant reluctance is generally valid and leads to considerable simplicity in magnetic circuit analysis.